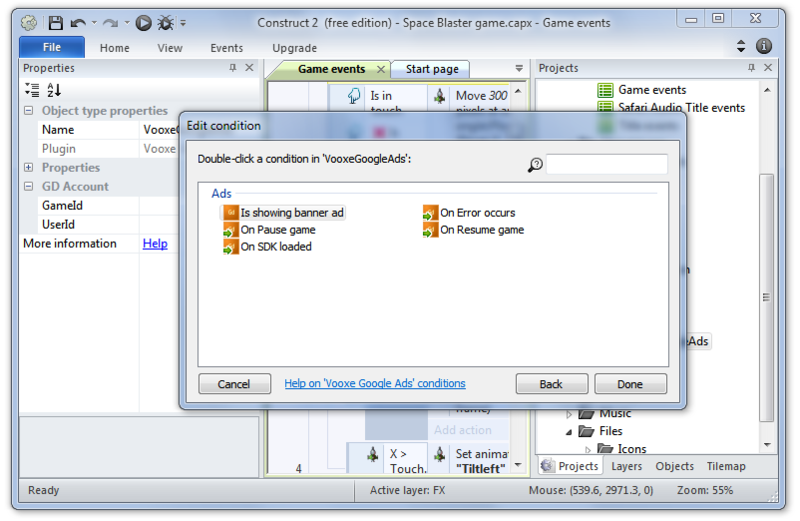 Welcome to the Gamedistribution.com HTML5 SDK for Construct 2 wiki! 11-12-2017 - It should now be possible to minify and mangle your project. Please let us know if problems persist. Do make sure you download a new version of the SDK. Feel free to request for help by sending an email to our customer support at [email protected], when you're having trouble implementing the plugin. 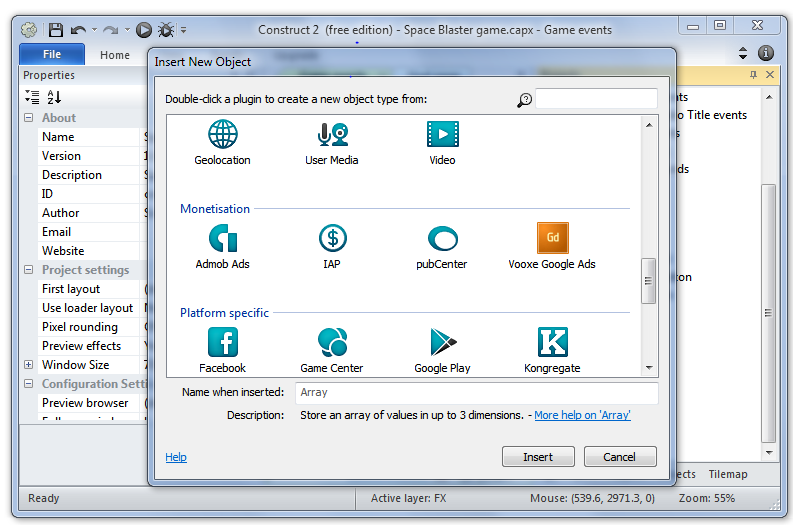 Select the new plugin within Construct 2 by right-clicking on Object Types and insert your gameId in the properties tab. You can find these values within your Gamedistribution control panel after creating a new game. 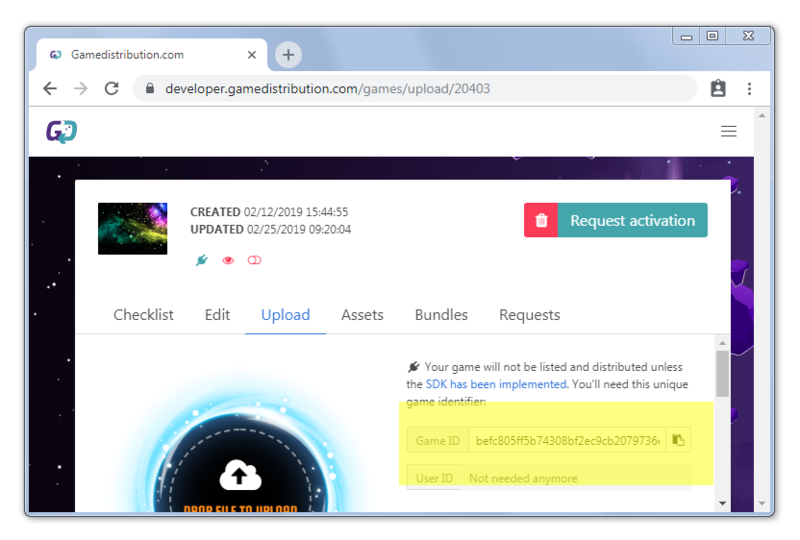 Loads the Gamedistribution.com HTML5 SDK. Add this as soon as possible, as it is mandatory for calling any advertisements. Only do this once! Calls an advertisement, you can call this whenever and as often as you want. Calling this will also invoke the pause game method. Sends how many times 'PlayGame' is called. If you invoke 'PlayGame' many times, it increases 'PlayGame' counter and sends this counter value. Sends how many times 'CustomLog' that is called related to given by _key name. If you invoke 'CustomLog' many times, it increases 'CustomLog' counter and sends this counter value. On SDK loaded Called when the SDK is ready. On Error occurs Called when an error has occured. On Resume game Called when an advertisement is closed or not received. On Pause game Called when an advertisement is received and ready to show. Is Showing Banner Ad True if currently showing an advertisement. 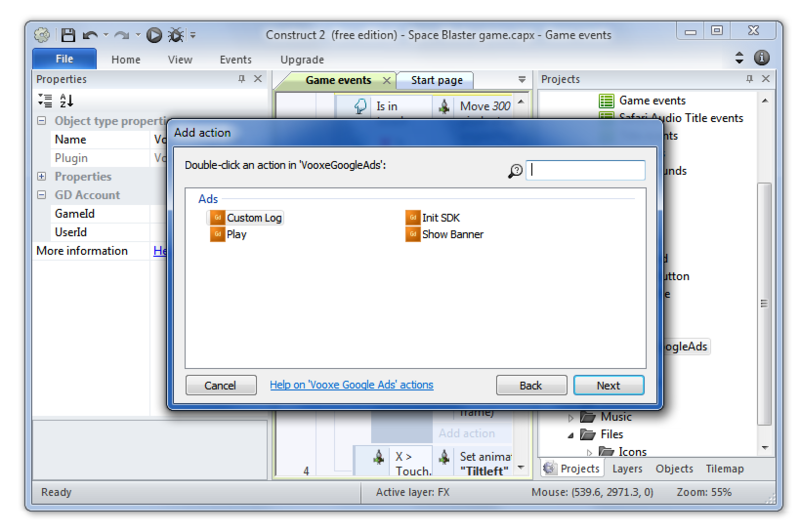 Right-click Object types in the 'Projects' tab, select Insert New Object and select VooxeGoogleAds in the 'Monetization' category. 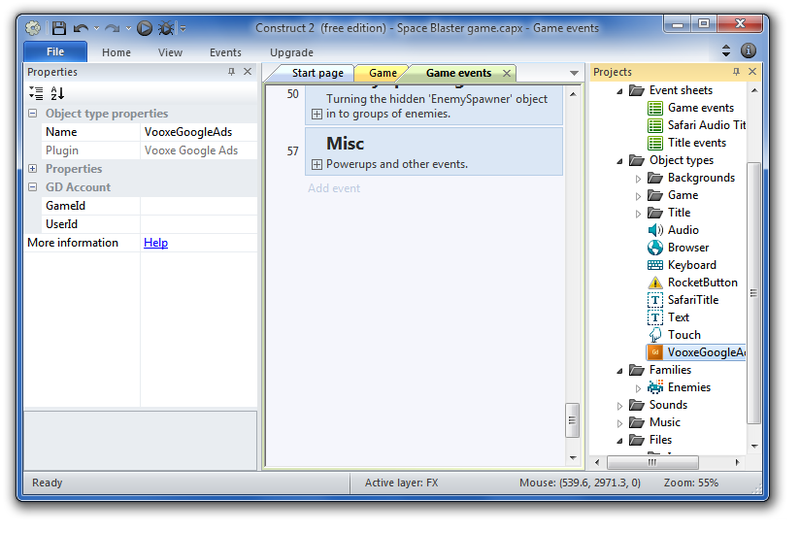 Click VooxeGoogleAds and insert your GameId in the 'Properties' tab (left, under GD Account). 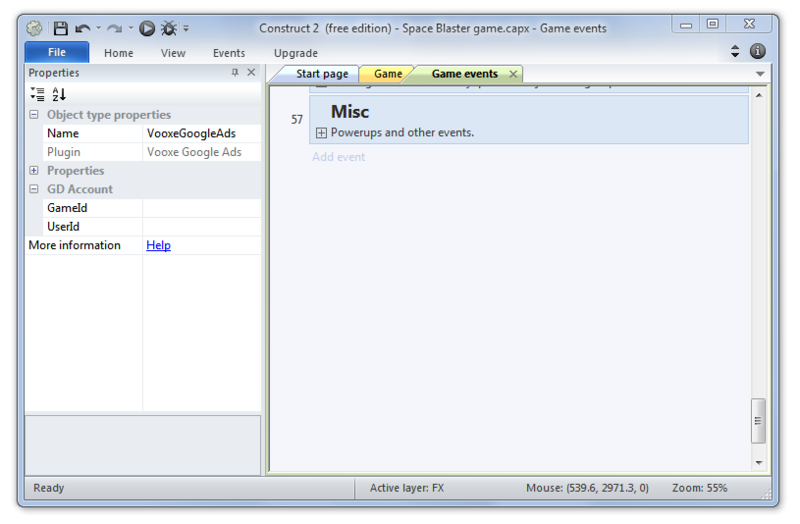 Double click the GRAY area to create an event to be tied with an advertisement request. 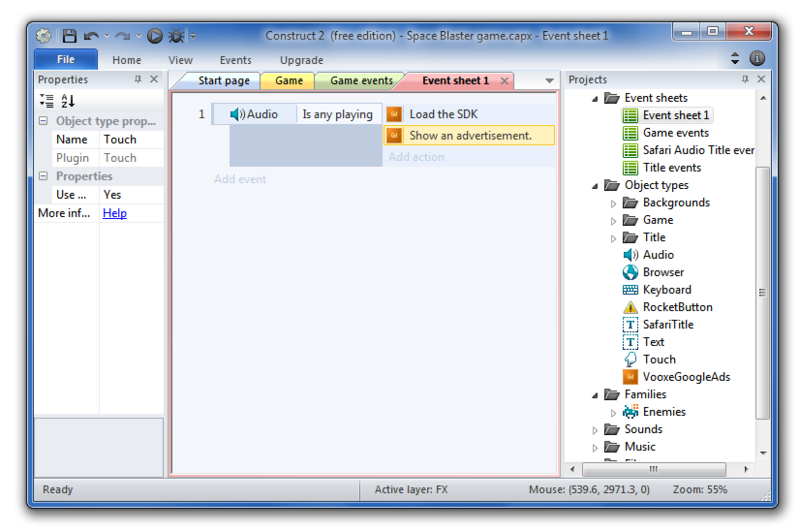 You can also tie the following steps to an existing event in your game flow. 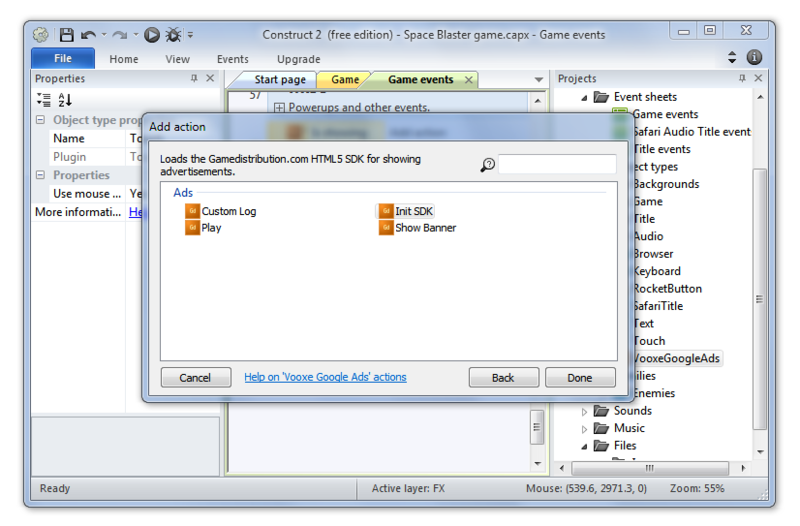 Choose 'Init SDK' as an action to tie to an event in your game flow. You can now call the 'Show Banner' action - whenever and as often as you want. We will make sure to reject any premature calls. 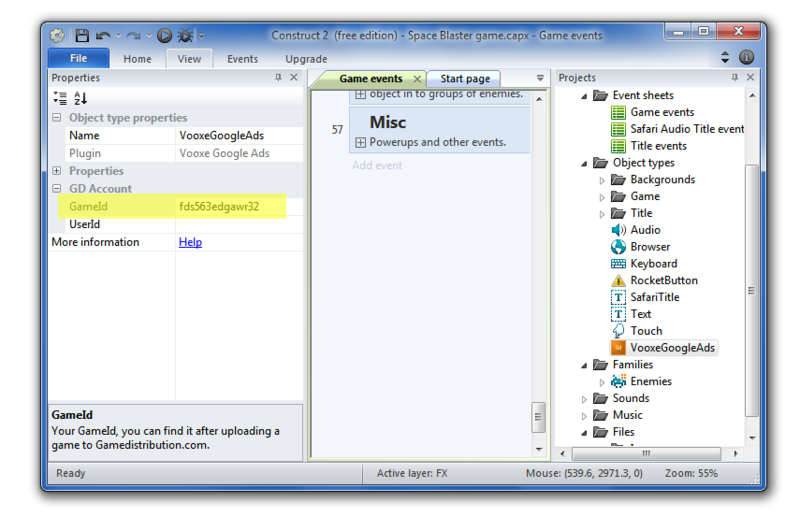 Add events for pause and resume game. You have to stop your game and mute all sound & music when you see an advertisement. All of our apis are available on GitHub. You're free to port it to other platforms.